Internet Sales Amount in the AdventureWorks cube comes from the SalesAmount column in the FactInternetSales tables in the AdventureWorksDW database. If you run sql-statements on that column and check for, is null and = 0 , it will show that no rows in that table have null or 0 in that column. Conclusion: the nulls or empties in the cube do not come from the fact table in the data source. If you open the Adventure Works cube project and check the measure [Internet Sales Amount] you can see that it uses an advanced property called measure expressions to calculate this value with a currency rate. Measure expressions are not the key problem here so I will leave that subject. So back to the problem of removing the nonexistent customer that appears in the cube but not in the fact table, how do we deal with this problem? 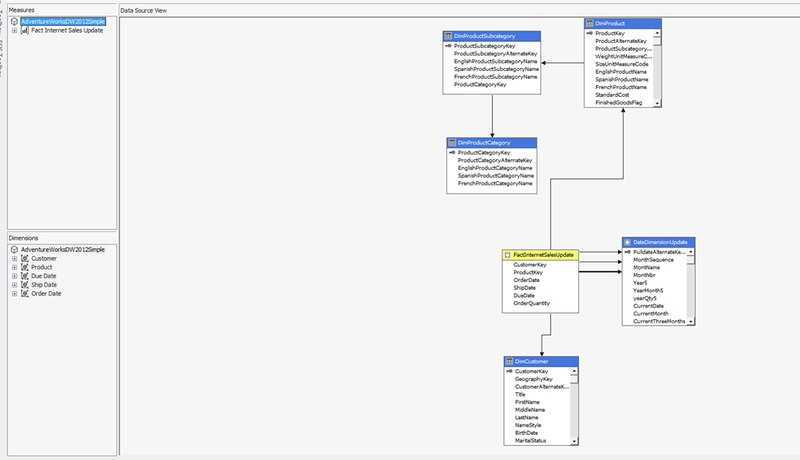 After reading MDX-solutions I knew that SSAS2005 have a little problem with null. With measures a null value can both be zero and null so you can you can use both values to search for these values and remove them. In MDX the Filter function will do the job of removing members will cell values according to a criteria. I searched in the SSAS2005 newsgroup on BottomCount and only found 7 posts, so this problem only concerns me and a few others. In one of these posts there was an answer that worked. This solution put a filter in the BottomCount function and disregards cells with null values. You can change the null in the filter to zero with the same result. I use the slicer (the Where-clause) to point at the year I am interested in. The slicer is the first part of an MDX-select that is evaluated and it points the BottomCount function to right year without having to enter it in to that function. Edit: My point here is to show the possibilities with MDX to solve a business problem but also point to that some client implementation of this were not good enough. Still ProClarity have been succesful and good enough in most areas but this important part was missed. In several AS2000 cubes a customer of mine had totals calculated for columns by ProClarity’s feature, Totals. This worked great even with calculated members. My customer had reports with several budget and actual sales values on the columns, both measures and calculated member, and the dates of the last month on the rows in a table. All these days were then summed on the last row with column totals in ProClarity Professional. When we migrated the cubes from AS2000 and AS2005 I did not think that these ProClarity Totals would be a problem but I was wrong. ProClarity also did a change with Totals between earlier releases(before SSAS2005) and started using the AGGREGATE function instead of SUM for the totals. Using AGGREGATE was very good news because we could build totals even on calculated measures with ratios, provided that you had the SolveOrder set correctly. 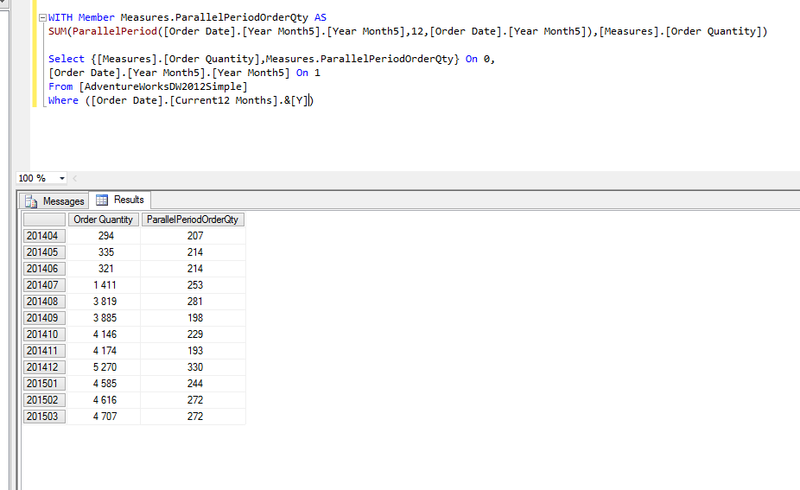 But in SSAS2005 we got this problem with totals returning null. To recreate the problem you will have to enter these three calculated members in the calculations tab in the cube editor of the Adventure Works cube project. The calculations are not exactly like the one my client used but the general idea is the same. I have added YTD only to check if PARALLELPERIOD was the problem. Process the cube (default) and open ProClarity Professional or Management Studio. After this is finished you can copy and paste the following MDX into anyone of these two client tools. It is the MDX created in ProClarity Professional 6.3 when you use the column grand totals feature but it will also work in Management Studio. You will see that the ProClarity Total ([Date].[Calendar]. [All Periods]. [ Grand Total]) will work for the measures, Internet Sales Amount but not for the calculated members that we have entered previously. You can see this in the second picture. When you look at the calculated member created by the ProClarity column totals, it is a mess of advanced functions that do not make a sence. One way to learn more about what is going on is to recreate parts of the code as named sets and calculated members in the cude editors calculations tab. What you will see is the same months that are part of the members I have choosen in ProClarity(2004 months). I think that most of this MDX is created to secure that only unique months will be included in the calculation for totals. Next, you can create this as a calculated member with [Date].[Calendar]. [Calendar Year] as the parent in the calculations tab. Here you will see a member under [Date].[Calendar]. [Calendar Year] that you can use together with the 2004 months on the row axis and it will return correct totals for the Internet Sales Amount Measure but nulls for the ParallelPeriod calculations that we started with. This is the way I debug MDX. Break it down into parts and see what happens to these parts. I have posted this problem to the Analysis Services newsgroup more than year ago and first I did not receive any answers except on less important problems in the MDX. After a while the always helpful Deepak Puri posted an answer that solved parts of the problem. Like Deepak told me you can change to SUM instead of AGGREGATE in the calculated member that ProClarity creates ( [Grand Total]) and you will get correct totals and not null. You can see this in the first picture. So be aware of this limitation in ProClarity Professional totals and that AGGREGATE do not work correctly when you have calculated members with time functions like YTD or PARALLELPERIOD. Other calculated members without time functions will work correctly. So why can you create totals with (AGGREGATE) calculated members that do not include MDX time functions? Why does it work with SUM? I hope that this behaviour will change in Katmai! This problem first appeared to me in a project where we have actual sales values on the month level and budget values on a higher level, quarter. In this project we have one measure group for actuals and one for budget in the same cube and we share most dimensions between the measure groups. Below the quarter level we could see repeting values appear on the month members even if the measure group only have budget values for quarters as the leaf level. It was nice to see that the Adventure Works cube have the same relation between sales tagets and the date.calendar dimension. You can check this relation and the granularity attribute in the dimension usage tab in the cube editor. I had an idea that the property IgnoreUnrelatedDimensions, for the measure group in the cube editor, would help with this problem but it did not. I would need a property like IgnoreUnrelatedDimensionLevels but it does not exist in SSAS2005. What finally helped was adding a MDX script in the calculations tab in the cube editor. Here the cube will set the levels on Calendar.Month and below to null instead of showing values that end users do not understand. I continue my discussion of the relation between the AS2005 clients and the rules of MDX. There is an interesting limitation in AS2005 regarding totals. It is mentioned in a whitepaper by the ProClarity team: "Using ProClarity with SQL Server 2005" released at the same time as SQL Server 2005. It is a simple table with product model categories on the rows and two measures on columns. This MDX is generated from ProClarity Professional 6.3 and I use a feature, Totals(that you see in the two calculated members), that does not work for rows. At the same time it make perfect sense to add Internet Sales Amount and Internet Tax Amount. But the row totals will be empty in ProClarity Professional and in management studio you will se #ERROR in the cells for row totals. In management studio you will also see the error message "Aggregate functions cannot be used on Calculated Members in the Measures dimension"
If you build the same table in Excel2007 you will see that the row totals are gone. They are usually switched on by default and the pivot tables also have the default of not showing empty rows or columns. The conclusion in the whitepaper is that this is by design and the workaround is to build a calculated member that sums the Internet Sales Amount with the Internet Tax Amount. 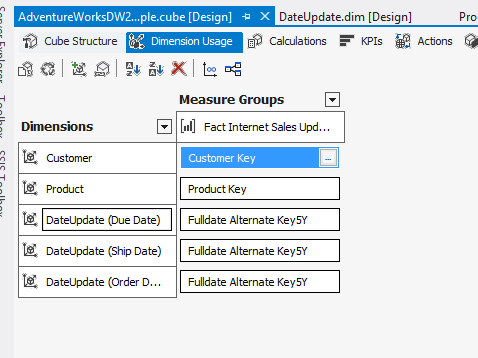 This is another short MDX blog entry in order to improve my MDX skills and to present end users problems of interaction with SSAS cubes. The Filter function have sometimes returned resultsets that can be tricky to explain to a customer. It is used in several clients like ProClarity and Excel 2007. I do not have all answeres yet so feel free to add a comment. Filter in MDX removes members from an axis that do not fullfill the terms i the function. The Where clause in MDX, also called a slicer, do not remove members only cell values in a resultset. Be aware that the Filter function condition is always about complete rows or columns, never about single cells. The second example breaks the rules of MDX and do not work. It says that the calandar hierarchy already exists on the Axis0 axis. I have no problem with that. In the third example , if I change the crossjoin to CustomerCountry and the measures, the filter clause will still work as expected, and add that year, in the filter, to the row axis, even if I have not explicitly asked for it. I was actually wrong here before but now I see that this example works as the first. It is the quantity for all countries, for a subcategory, that decide if the record will disappear or not. The interesting thing with the last example is that I cannot filter like this in ProClarity Professional 6.3 , on the [Internet Order Quantity] for the total product subcategory group. I must filter on one of the column members as well, like USA. Still all the the other countries will be left in the grid and that is not strange because they are part of row that includes USA (Tires and Tubes if you set the limit to over 2000). So the filter behaviour i Management Studio is not the same as in ProClarity Professional 6.3 . My opinion is that ProClarity’s way of implementing filters is more limited. This is the first part of my test of the Filter function and I have not tried enough examples yet to be really sure of how it works in different scenarios. I will update this blog entry when I find more interesting examples. The interesting thing with this script is that you get what the book calls an assymetric result. Each measure will not be repeated for every time member. When you click on members in a client tool like ProClarity Professional 6.3 you will never get this result because ProClarity will always do crossjoins on dimension members that you put on rows or columns. It is the same with Excel 2007. Assymetric results is new to me. I have created calculated members to produce this results earlier and I had no idea that I could write queries to achive this. Perhaps I have been to lazy and never thought of that most SSAS2005 clients do crossjoins of everything you put on an axis and ignores the other possiblity. When I pasted the Select into ProClarity Professional it created the same assymetrical result as in management studio. Should not these clients be able to switch on or off crossjoin because most reports are assymetrical?